Corsair has announced the immediate availability of its new Hydro Series HG10 N980 and HG10 N970 GPU cooling brackets. These easy to install brackets can be used to provide liquid cooling to Nvidia GeForce Titan X, GTX 980 Ti, GTX 980 and GTX 970 graphics cards that use the reference PCB layout. Corsair claims that with one of its brackets installed you will "substantially reduce your GPU’s temperature, allowing for greatly increased overclocking headroom and providing as much as a 25% clock speed increase". The Hydro Series HG10 GPU N980 and HG10 N970 cooling brackets work by replacing the existing graphics card cooling solution with a "precision engineered aluminium bracket," which allows you to connect up your Corsair Hydro Series liquid CPU cooler directly to the GPU. Many modern graphics cards require cooling solutions dissipating over 200W of heat so direct liquid cooling is a great advantage, facilitating a cooler running system with greater overclocking headroom – enabling users to squeeze even more performance out of their systems. Corsair's new brackets do include a fan, however it is a 70mm low-noise blower fan designed to actively cool components not covered by the water cooling block. There is a slight difference in the cooling bracket functionality due to different board layouts; the HG10 N980 fan actively cools both the card's memory and VRMs, while the HG10 N970 actively cools the VRMs. Whichever you require, Corsair says you can rest assured that the whole of the graphics card will receive cooling where it is required. These new coolers are said to be immediately available worldwide, either model costs £29.99 / $49.99. Buyers get a two year warranty. 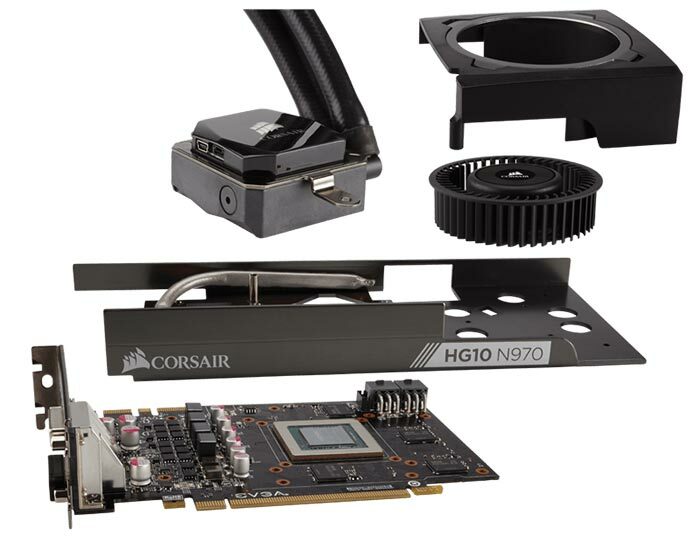 For a full list of the graphics cards compatible with the Hydro Series HG10 N970 GPU Liquid Cooling Bracket see here – navigate to the 'Tech Specs' tab. Likewise you can find compatibility for the HG10 GPU N980 here.